By late July, large unsightly loosely constructed, silken nests may begin to appear on branches of roadside or woodland hardwoods and shrubs. 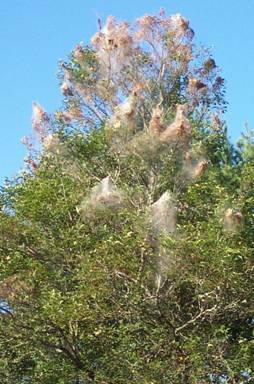 The nests are produced by hairy caterpillars known as the fall webworm. The feeding of these insects may occasionally strip small or large trees of their leaves. By August and September the webs may become very large and may even join together and detract greatly from the attractiveness of some trees and shrubs on streets and lawns. In fact, this insect creates a problem on ornamentals as well as some roadside trees and scrub growths. It is not considered a threat to hardwood forests, nor is it a threat to the health of infested trees as it occurs too late in the season after trees have already stored up much of their food reserves. Apple, cherry, ash, willow, oak, birch, elm, other deciduous species. In early fall, the caterpillars overwinter as a pupa in the soil. The winter is spent as a pupa and the following summer the adult snow-white moth emerges, usually around late June and early July in this area. Shortly after emerging, the moths lay their eggs, usually on the underside of leaves. Hatching occurs within 2 weeks. Mature yellowish caterpillars about one inch long have many tufts of long hair and black and brown markings. Webworm larvae feed within the nest whereas the eastern tent caterpillar feeds outside its tent. Also, the eastern tent caterpillars appear in very early spring and should not be confused with the webworm of August and September when their webs are most conspicuous. Webs of eastern tent caterpillars occur in branch crotches of cherry and apple type species. Another species, the ugly nest caterpillar may also occur about the same time as the webworm but the ugly nest caterpillar is smaller, yellow and naked with a black head. The nest of the ugly nest is more tightly constructed and much smaller in size. This insect increases in numbers periodically at which time it is subject to many natural enemies. 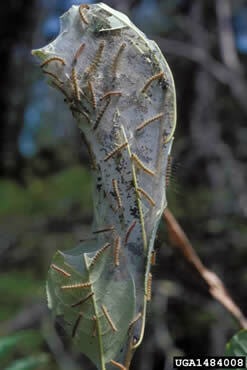 As the populations increase, so do their parasites and predators increase to destroy the webworms. Thus, within a few years these natural enemies again bring down the populations of the fall webworm. There are at least a dozen species of parasites and predators involved in the control of this pest. In small trees, the tents may be removed by hand, or cut out and destroyed. A forked stick or a stick with a nail in it may be inserted into larger webs and by twisting it the loose webs may be twisted off from the trees. Thorough spraying with pesticides labeled for use against tent caterpillars, which include carbaryl, diazinon**, or acephate as soon as the small webs and caterpillars are seen will arrest the growth of the caterpillars and their nests. Bacillus thuringiensis (Bt) a microbial product, is also registered for use against this pest. Apply the insecticide as directed on the container. Proper timing for spraying will be about mid-July. Burning the nest is not recommended as it may be harmful to the tree. **Some formulations are restricted-use pesticides and may only be purchased or used by certified pesticide applicators. Caution : For your own protection and that of the environment, apply the pesticide only in strict accordance with label directions and precautions.